Aber is the slightly slim­mer older sis­ter to Ilur, an example of which is sailed by Dinghy Cruis­ing Asso­ci­ation Pres­id­ent Roger Barnes, and see­ing both designs at Beale Park last year con­vinced me that Aber is all the boat I really need, for day-sail­ing, camp-cruis­ing, and the odd ‘raid’; she may not have quite the sea-keep­ing abil­ity of her beam­i­er and deep­er sis­ter but, ‘teal’ being ‘a small dab­bling duck’, I will avoid put­ting that to the test. She is an easi­er row to be sure, besides being more eas­ily launched and recovered solo. Her launch party was at the end of May, and next day Fabi­an and I took her out off Mer­sea Island, where her beha­viour, wheth­er under sail or oars, was delight­ful, show­ing all the prom­ise I expec­ted of her. Pic­tures under sail when I can get some! But she has yet to sail again—I really must do bet­ter. Her next out­ing will be the Eng­lish Raid at Fal­mouth in a few weeks’ time. More pho­tos can be found here. 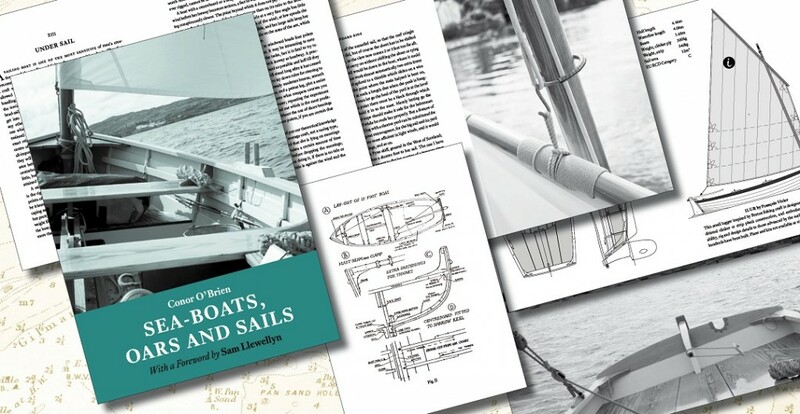 Conor O’Brien’s Sea-Boats, Oars and Sails advoc­ates and describes exactly such a craft as Ilur and Aber, and our new edi­tion is illus­trated with pho­tos of An Suire (the Sea-Nymph), the Ilur of boat­build­er Tim Cooke in south-west Ire­land.